← Book # 8: Grudgebearer by Gave Thorpe. Well, I am finally caught up. 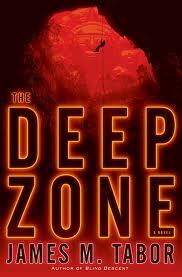 Over my vacation, I read The Deep Zone by James Tabor. This book appealed to me because it had to do with caving. A subject/hobby that has always fascinated me. I have also read part of his non-fiction book Blind Descent (still working on it). I enjoyed this book, but it has flaws. Lots of flaws. James Tabor has a long ways to go to become a good writer. Now, don’t get me wrong. I enjoyed this book, and read it quite quickly, but it is not “good” in the sense of good. You will not marvel at the writing in this book, the plotting, or the characterization. In fact, the first two chapters o this book have some of the worst, most-cliched writing I have seen in a long while. If I were the editor of this book, I would have made those first 2 chapters re-written. They are beyond terrible, and if I had not paid for this book, they may have stopped me. Aside from the writing, the basic plot of the novel (go into a supercave and retrieve an extremeohpile is what drew me in. The caving and basic plot works. There were no surprises in this book for me. I was never in any real doubt of what was happening and what was going to happen. It is a typical suspense novel, in the vein of James Rollins, but not nearly as well plotted or written. James Tabor will get there, and I hope there is a sequel in the works that inovlves a cave yet again. If it does not involve a cave, I don’t know if I will be able to wring myself to read it. This entry was posted in Reading and tagged adventure, caving, james tabor, reading, spelunking. Bookmark the permalink.